Mailbag: 2015 belonged to Jordan Spieth, but what about 2016? Jordan Spieth didn't have nearly enough hands for all his trophies this year. Leave it to Jordan Spieth to wrap up the 2015 PGA Tour season exactly how it should have been wrapped up. 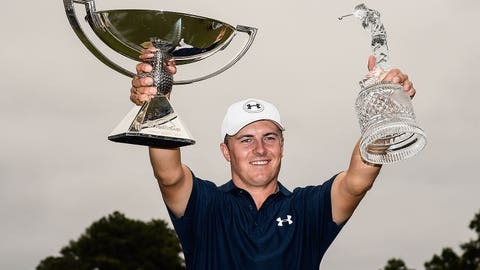 His win at the Tour Championship was a perfect example of how Spieth played all year, never letting anything distract him on his way to another victory, another couple of trophies and back to No. 1 in the world. It’s always fun to look back on what you predicted before the start of a golf season. I forecasted 25 things I thought might happen this year, failing to mention Spieth in it one single time. Yikes. I missed on a few, of course. Tiger didn’t have a big season (is there an “understatement of the year” font?). Dustin Johnson didn’t win that first major championship (close, but Mr. Three Wiggle doomed him at Chambers). Brooks Koepka did win on a PGA Tour event (way to go, me!) but was not selected to the Presidents Cup team as I predicted (what were you thinking, me?!). Rory did, in fact, have a down season, by Rory standards. But the one prediction I made that actually wasn’t far off was how epic this major championship season, and really, the PGA Tour season as a whole, would be. We now have legit interest in the future of professional golf, something I’m not sure you could have said two or three years ago. Kids are flocking to events to see Jordan, Rory, Jason and Rickie, and the talent level of those four and many others continues to rise. I’ve said it before, but this has easily been the most enjoyable year I’ve ever covered in golf, and I don’t see it waning when we get to 2016. But for now, let’s answer some mailbag questions about the season that was and what we might expect to see when golf gets going again next year (or this year . . . that wraparound season always gets me). @shanebacon what are your top 3 moments of the 2015 season? Considering the controversy with Suzann Pettersen leading into singles, the Americans coming back and bringing home that trophy is something that golf fans won’t soon forget. (And if you don’t believe me, simply put the American Ryder Cup team in that same scenario for a minute . . . Ian Poulter not giving a putt to Rickie Fowler after players walked off the green, only to see Team USA mount an epic comeback in the face of the adversity to bring home a trophy they’ve had trouble winning in past years? It would have been the most talked about moment in sports, and that’s during NFL season). The second is the final round of the U.S. Open and the roller-coaster ride Spieth went on at Chambers Bay to snag a second straight major championship, not to mention Rory McIlory and Adam Scott getting hot earlier in the day, the tee shot on 16 by Branden Grace, the ridiculous bounce-back by Louis Oosthuzien after opening the championship with hockey sticks, the Dustin Johnson birdie on 17 and his tee shot/second shot combo of perfection on the 18th — and then, of course, all the drama that unfolded when DJ three-putted the 18th and handed the trophy to Boy Wonder. Whew. If that felt like a long sentence, that’s because it was meant to test your wits — much like Chambers did for those players that Sunday. What an incredible week at the U.S. Open, and a finish everyone was happy with (as long as you aren’t a Johnson or a Gretzky). The third memory for me goes to the Old Course and that final round of the British Open. Considering all the weather delays and how disrupted that Open was, the final round was as exciting as it gets, up until Spieth went bogey-par on the last two holes and left us with a playoff that felt a bit deflated (sorry Zach Johnson, but it’s true). That birdie putt on the 16th by Spieth was probably my single favorite moment of the year because he had to make it and somehow did. His ability to continue to jump back up off the canvas when things went against him at St. Andrews (his three straight birdies after an ugly bogey on the easy par-4 9th during the third round . . . his birdie-birdie run after making double on the 8th during the final round when it all seemed lost) was a microcosm of his season. Even when it seemed that fatigue was setting in during the FedEx Cup playoffs, Spieth found a way to muscle up some interest and play incredible golf at the Tour Championship, capping off a year to remember. Get all the latest coverage from the golf world at Golfweek.com. The Solheim Cup, the U.S. Open and the British Open will be the three events I remember most from this year. But, really, it’ll be the entire season that will stick with me as one of the greatest of this generation. Bacon: For me, it’s simple; I want to see a Sunday dogfight at the majors between big names. Looking at both the U.S. Open and British this season, there is little you’d change, but could you imagine if Rory hadn’t shot that front-nine 40 on Friday at the Masters? Say he plays the front decent and posts 1-under — that’s five shots better, thus putting him just a shot back of Spieth’s 18-under total (Rory finished 12-under for the week). I’ve said this a billion times by now, but we never got Tiger versus Phil tied for the lead down the stretch at a major. We have been waiting for the best in the world to go at it, a Duel in the Sun 2.0, and it happening at Augusta National seems fitting, doesn’t it? @shanebacon if '15 was a 9 on a greatness scale what makes '16 a 10? Spieth battling Rory at on Masters Sunday is what the golf world wants to see, just like Spieth going against Day at the PGA Championship would have been incredibly exciting if Day hadn’t been golfing like a robot that week. I’m sure if we had a major showdown between Spieth and Woods it would literally break the Nielsens, but I’m thinking more likely scenarios for ’16, and a McIlroy-Spieth run on Sunday at a major would be the game-changer from ’15. Bacon: This question interested me so much that I went back and looked at every season a player had following a year in which he won more than one major (there have now been 32 multiple-major seasons dating back to Gene Sarazen in 1922). @shanebacon What are the expectations for Spieth in 2016? Is it even possible for him to repeat that type of season again? Here is the list going back to the 1980 season for Jack Nicklaus, with the year each player won two majors in parenthesis, followed by how he did the following year (majors are also counted as PGA Tour wins, so, for instance, in 1983 Tom Watson won the British Open as his lone PGA Tour victory of the season, but it’s counted here both times). What this tells us is, outside of Tiger Woods in his prime, it’s really, really tough to follow up a multiple-major season with anything that looks remotely close to what you just accomplished. Rory struggled last year, partly due to injury, but we’ve seen legends of the game not even card a single win that next season after snagging at least half the majors. Tiger Woods was able to follow a strong majors season with another, but most multiple-major winners don’t. The difference in Spieth and someone like Rory, who won two majors last season and failed to snag one this year, is that it seems Spieth has a better B and C game than that of Rory (and everyone else on Tour). When Rory is on, his A game trumps all, but when we get to the guys who can still without their best, the list of legends shortens. Tiger was also so impressive when he didn’t have his best stuff at big events, somehow finding a way to contend, and win, anyway. Spieth is a little like that, putting heavy-duty band-aids on his game on the day it isn’t there, knowing that a range session and a good night’s sleep could do the trick and bring him back to his best. But realistically, you have to think he can’t continue this level of play through the offseason and into the ’16 major rotation. I hope he does, but golf is imperfect for a reason. Those great bounces and perfect reads will eventually go the other way, and when they do a new face will be there holding the trophy or wearing the jacket (hello Brooks Koepka and Hideki Matsuyama!). Bacon: Can I say Dustin Johnson again? Is that an OK thing to say at this point? @shanebacon do you expect a big name to win their first major next year? If so, who? I think if we are looking at guys who are close to winning a major, Dustin is leading, but it was Fowler who took a huge step the last couple of seasons to get that first big one. I think the guy with the best chance to just blow the field away and win one is Dustin, but the guy with the best chance to be in the conversation for four days and close the championship outright is Fowler. Bacon: Given those two, I think Phil is the obvious choice. Sure, he hasn’t won since that British Open in ’13, but he has been close in two majors since then, finishing second at the PGA in ’14 and T-2 this year at the Masters. 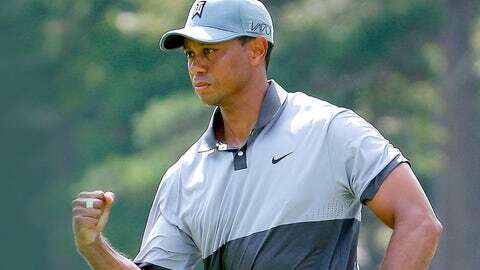 @shanebacon Who wins again on PGA Tour in the future: Tiger, Phil, both, or neither. Phil Mickelson might just have one more Masters title in him. I think Mickelson has another green jacket in him. The course has always been perfect for his abilities, and when Augusta rolls around each year, something clicks in Phil like it has so many times for Jack Nicklaus, Bernhard Langer, Fred Couples and others. If Tom Watson had the British for all those years, Phil has the Masters, and I see him getting to four wins there before it’s all said and done. As for Tiger . . . who the hell knows at this point? When the highlight of your season is a T-10 at the Wyndham Championship, it doesn’t exactly scream “big year upcoming!” — and now with another injury as he inches toward 40, the game just simply isn’t there. I think Phil wins a few more times before he turns 50, and possibly once or twice after (Davis Love III won this year at 51), but I’ve basically given up on trying to predict what will happen next with Tiger. Maybe he wins the Grand Slam, maybe he gives up the game . . . at this point, would anything surprise you? Bacon: Caroline, I’d love to say yes for ’16, but Oakmont hasn’t been kind to Mickelson over the years. In 1994, Mickelson finished T-47 as a young lad, and in 2007 he missed the cut, only the second time (and first since 1992!) he was cut at the U.S. Open. @shanebacon Will Phil finally win a US Open? This also brings up a good question — is there really a shot Phil wins the U.S. Open at this point? Look at his last five starts in our national championship: T-54, T-65, T-2, T-28 and T-64. Only that one run, at Merion in ’13, saw Mickelson have a chance at this after getting so close in years past. Oakmont might not be a great shot for Phil, and Erin Hills (2017) will be a roll of the dice in terms of how it fits certain players, but after that Mickelson has Shinnecock, Pebble, Winged Foot and Torrey Pines. Those courses are perfect for Phil, but it’s Father Time he will be battling when we get to that point. All that said, he will be 46 next year. Isn’t that the lucky number for legends to complete something special? Bacon: Well, when you look like this, what do you expect? @shanebacon Danny Lee played in 36(!) events this year; where does that rank in the pantheon of Ironman golf efforts?That's a lot of rounds! Bacon: But . . . but . . . we have the Presidents Cup! @shanebacon You're heading for a looooooooooong winter. Stay tuned, more to come on that next week. Shane Bacon is a regular contributor to FOXSports.com’s golf coverage. Follow him on Twitter at @shanebacon.